All three of the grandchildren who’ve been here came with interesting reading habits. They read fantasy. I picked up a couple or three to read, and was not impressed by thin plots and limited vocabularies. Emily joined book club, realized thought provoking literature was available, at the library, no less, and moved on. A year ago this past summer I mentioned to Laura that some book she was reading seemed based on Grimms. I unearthed Grimms from the basement library, and she read the little green volume from my childhood. Then I handed over Andersen, and suggested she read at least up to the nightingale story, or the little mermaid. For their first Christmas here I flooded the children with classics, hoping to influence their reading habits for the better. The Andersen volume went to Emily, with some others, and languished on the bottom shelf of her bookcase. Laura was the reader of it, though, and I see it now lives on the bottom shelf of her bookcase. And so on to this year. Over the summer I took her to see the professional production of a play. This year she’s joined drama club. She spent all of junior high being too timid to join. Over the summer we went to a production of You Can’t Take It With You, and the ending was surprisingly well done. I was impressed by the set and the costumes, and pointed out to Laura all the work that goes into a production by the folks who put it on. She’s joined drama club “to work on sets or costumes.” One doesn’t ask. Those are pleasant parts of the world through young eyes. My unpleasant part is band, band shows and football games. Joe, my car pooler, has a license and a car, so I have Laura’s round trip. Retrieval from band practice at nine o’clock plus Wednesday nights is not too far outside the pale. But, Friday night football and the occasional Saturday band show are! The young, tailgating parents are, frankly, insane. But, at least they are already at the event, and can retrieve Susie and Johnny and get on home. For me, when pigs fly. I have found a school website that posts the big plays each quarter, and the score. I look at it occasionally, and about mid fourth quarter head off to the school. We’re talking late for grandmas, but I flip on the local public radio station for Los Angeles Theater productions. Laura generally has an unfavorable remark or two, before she falls asleep on the way home. Last weekend she suddenly listened to the production of Pride and Prejudice, and asked me to fill her in on characters and what she missed. At home, we sat in the drive, at midnight, listening to the end. I looked. Complete Works of Jane Austen lives in another bedroom now. Wonderful! The classics are a good thing for anyone to read. Sometimes it is hard as you know to get them to do so. Jane Austen ranks up there with my favourite authors. you have wrought miracles. our children and our grandchildren will surprise us if we just give them the chance. none of this is wasted, sometimes it takes a while to sink in but it is all worth it and I am eternally grateful for all I had exposure to; I still remember singing in school musicals, and the music my mom played while we fell asleep and the classic ballets we watched on TV and then later I went to see them in person. I love how you inspire the grandchildren. Well done! Hooray for Laura expanding her reading, something I've never been able to do. I've tried reading more literary novels and just can't, I find them too long winded. That is all exciting news. The seeds of great things to come. That is wonderful news. I have Jane Austen's novels (including her very first written when she was very young) and must reread them. I never acquired a taste for Dickens though. Once they have boyfriends let them read 'Persasion' it moves me yet. What a great environment you provide for the girls... just having it available seems to work there... I'm impressed! You are a wonderful grandmother, Joanne and a great mentor. Sad to admit, I read all my classics in the comic book form. Good that they read the real thing. You are truly a wonderful grandmother. I did love Pride and Prejudice and have read most of the Austen novels. How neat that you did have a hand in shaping the reading they are selecting or have selected since they came to you. The good thing is at least they were reading before, maybe not the best of selections, but at least reading. We read the classics at school. My favourite is Charles Dickens Great Expectations. I hope perhaps Laura will find that on a shelf one day. Dickens was an amazing story teller. We were also fortunate in the late 1950s and 1960s to have many of the great classics made by BBC drama for children's television. Good reading Laura. What a wonderful grand mother you are Joanne. The discovery of literature when young is a wonderful thing. I remember vividly reading Les Miserables, Jane Eyre and Paradise Lost -- As a young girl I had a copy of Grimm's Fairy Tales, which I devoured over and over again! How different Cinderella and Snow White were from Disney -- I couldn't get over it! 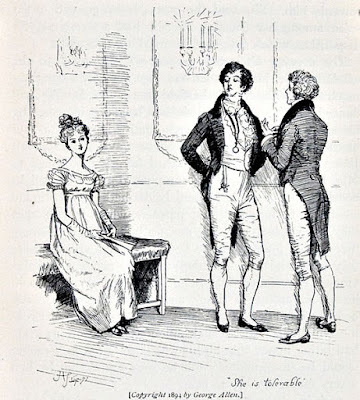 I love the Jane Austen novels and often wish I had read them in high school. Married at 18, I had no idea what marriage is. Jane Austen could have told me. Softly, softly catchee monkey. Sneaking up on the young with good literature! The idea of someone from this generation reading Jane Austen makes my heart happy. Now you know what hell it is living in Bath. Too often appreciation of the classics comes with maturity. I suppose we just have to keep exposing the children to them until that little light comes on. That's just wonderful that the children are being exposed to the classics. Now, isn't that a very nice surprise, the Jane Austen books in her room? (And never mind what Tom grumbles: I love them) And hope she will too. I can't get my grandkids interested in reading any of the classics. They like fantasy too! And I agree with you on going to football games. I head out at the start of the fourth quarter and she meets me on the corner!! You certainly have been a good influence. I do think even reading fantasy is better than not reading at all. Is the Harry Potter series categorized as fantasy? My two studied some great literature at school but otherwise read fantasy.